Well we have all heard of the Gunfight at the OK Coral……..this is the bunfight at the local Piazza! This is a traditional event, a cake festival at the beginning of August, as part of the Ferragosto celebrations. Local people bake the most delicious and beautiful array of cakes, displaying them in the square and there is a competition. I assume that the prize is for the best looking cake….or perhaps for who gets to taste them first in the frenetic cue for pieces of this delicious fayre. 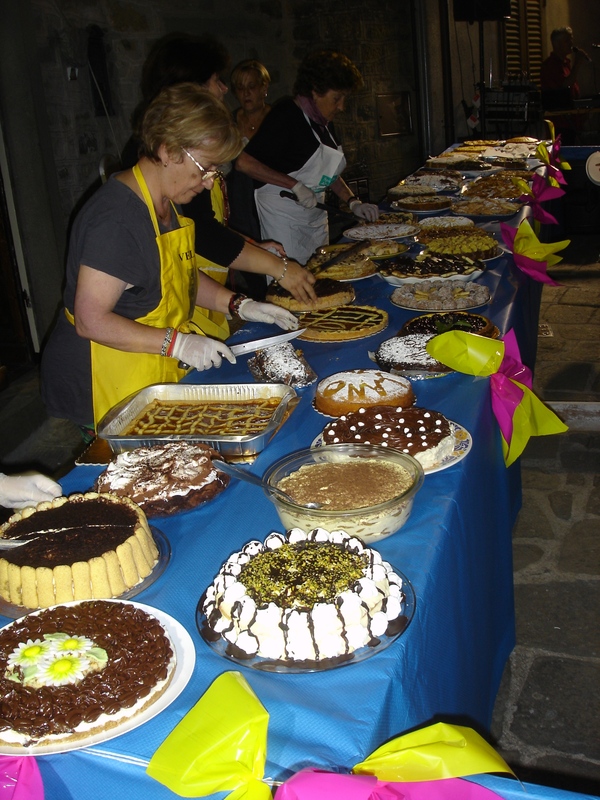 This picture was taken at around 10.30 in the evening as to display cakes outside on a warm August evening would have been very difficult earlier in the day. 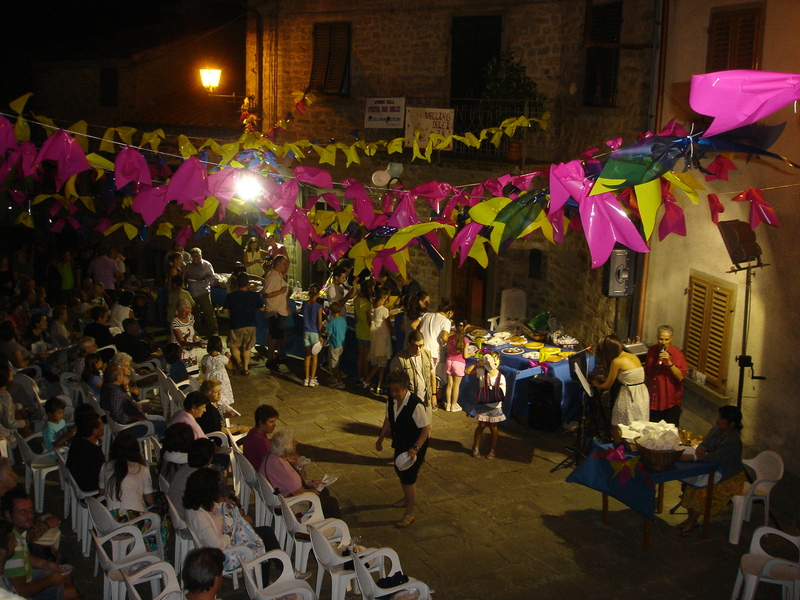 The small piazza at the top of our village of Vellano was crammed with people at this time and music was provided by our local crooner Liscio. He also provided all the music for our 50/60th Birthday Party in June this year and very entertaining it all was….part Italian country songs and part Karioke. 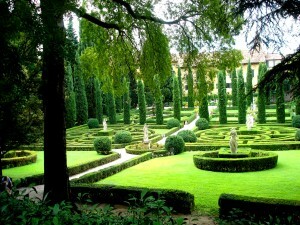 Whilst the weather in Tuscany has been strange and unusual for us all this year other normal summer activities and festivals continued on. We visited Verona in the Veneto in August, for another of Italy’s more famous festival, the Verona Opera Festival in the Roman Arena. Where gladiators once fought with Lions and Tigers opera goers now vie for seats at one of the most spectacular theatres in the World. The audience of about 12000, dressed in a range from the most glittering to tourist casual began the spectacle with the overtures and a sea of traditional candle light……then after about half an hour of the performance…..rain! After waiting 2 hours for the showers to peter out the performance was abandoned. So now we must wait for another twelve months for the next years round of Verona performance to begin and another chance to see the fabulous Aida emerge from the artificial but beautiful stage representation of Memphis (this time not waiting for Elvis). 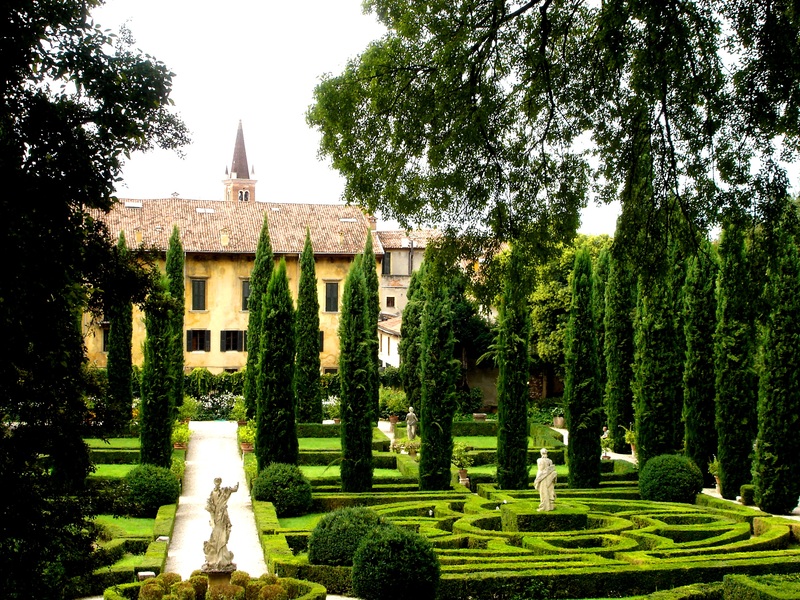 There are other delights in Verona of course to sea and we took a meandering walk and climb around the lovely Giusti Garden’s, with it’s great views over the city.